Author: Marianne Bechhaus-Gerst. Series edited by: Hans-Jürgen Sasse †, Rainer Voßen. The present work on the two languages Nobiin and Dongolawi/Kenzi, which have formerly been regarded as a genetically defined sub-group of the Nubian language family, explores, theoretically and in the form of a case study, the possibilities and limits of a sociolinguistic approach in diachronic or historical linguistics. The analysis of contact-induced linguistic change in the two Nubian languages is mainly based on a systematic comparison of the morphology of these languages. A new examination of the written sources of the Nubian Middle Ages reveals that the linguistic processes are the result of rather complex socio-historical developments in the course of that period of Nubian history. It is concluded that the relationship between the two languages cannot be explained adequately in terms of genetic linguistics and classification. The linguistic data is presented in the appendix thus making it possible for the reader to judge its interpretation critically. 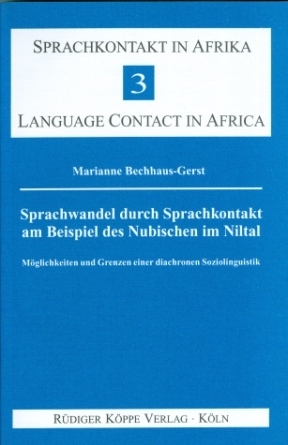 The last study of Marianne Bechhaus-Gerst represents again an important step forward in our knowledge of the linguistic and ethnical past of the Nobiin and Kenzi/Dongolawi people. The sociolinguistic implications allow also to apply her results to other linguistic disciplines.